Sunday morning at 10:30 am - Morning Service & Kidfuge is back in service! 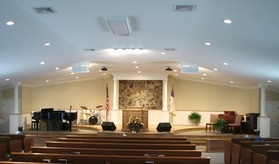 Welcome to Refuge Assembly of God - we invite you to look around and get a feel for our church. If you're not currently a member - we'd like to take this opportunity to invite you to one of our weekly services. Click the Calendar tab to see what is going on at Refuge, and of course, feel free to reach out and call one of our Pastors or Ministry Leaders. 6:30 pm - Mid-Week Service; Royal Rangers; Girls Ministries will resume soon!